MOSCOW, Idaho – Less than a week into the Idaho Vandals’ preseason camp, Mason Petrino’s overarching issue isn’t a looming quarterback competition with Colton Richardson. “I feel a lot stronger. I feel put together and heavier,” says Petrino. Richardson, a sophomore who played most of a game against New Mexico State after Petrino was hurt, and who started and won Idaho’s last game as a Football Bowl Subdivision team against Georgia State at the end of last season, believes his knowledge of defenses and being able to check out of a play to avoid a sack or no gain has improved exponentially because he got to see everything live. Like Petrino, he has also benefited from an off-season in the weight room. He looks leaner and quicker on the field at a listed 6-4, 254. The competition to see who becomes Idaho’s new starting quarterback begins in earnest Saturday when the Vandals hold their first scrimmage. Although the quarterbacks won’t be live, “they will see all that trash around them,” according to quarterbacks coach Charley Molnar, as the other 21 bodies on the field fly about for real. The look the quarterbacks get on plays will have greater credibility than when the team is in helmets, shoulder pads, jerseys and shorts, as it is this week. Until Saturday, however, Petrino and Richardson are simply colleagues in cherry jerseys, off limits to tacklers, each trying to hone his craft. Molnar deftly dodged a question about how things are different this year from last. “You always feel like you need to get two guys ready,” he said. Last year, Idaho needed three quarterbacks to get through the season. Nonetheless, things are different. 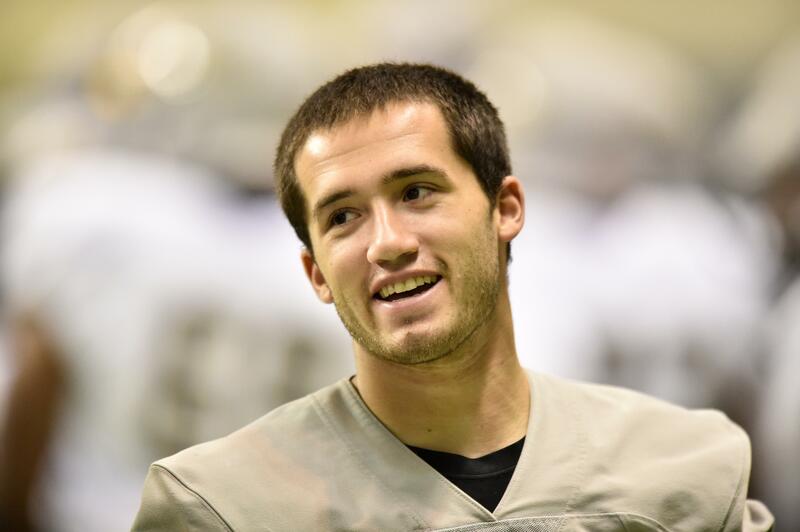 In camp last year, four-year starter Matt Linehan seemed the eternal quarterback, dominating the Vandals backfield. Meanwhile, Petrino was splitting reps between the quarterbacks and wide receivers, and freshmen Richardson and Dylan Lemle hadn’t even been to class yet. Lemle is not at practice this year; he’s dealing with academic issues, according to head coach Paul Petrino. On the next rep, the 6-5, 229-pound freshman misfired. “That’s not,” Molnar said curtly. Early in the season, especially, Paul Petrino says both may play. “They can both run each other’s plays,” according to Molnar. Richardson acknowledges that “Mason is quicker than me,” and read-option, where a moving quarterback decides to keep or pitch to a back, depending on how the perimeter defense is playing, is part of Idaho’s offense. However, Richardson, about 5 inches taller and 60 pounds heavier than Petrino, clearly has the bigger arm, and in Idaho’s quick passing game in the early practices, he has been able to dominate safeties and linebackers, rifling throws into tight windows in the middle of coverage before defenders can even begin to break on the ball. Both Petrino and Richardson have some frame of reference for what they’ll be dealing with in the preseason. Each worked his way up a depth chart in high school. Molnar likes the way the two are approaching their developing rivalry. “We have a great room now,” he said. “They love football. They come to meeting ready to learn, and they are both team players and support each other. He added Idaho may feel no real urgency to settle on one quarterback until it gets into the Big Sky Conference portion of its season. In the meantime, all the benefit of competition, with none of the winner-loser downside, is before them. Published: Aug. 7, 2018, 6:18 p.m.